122 species were identified this year. During spring and autumn a total of 310 hours of ‘’skywatching’’ was made, a slight increase (+2%) on last year. There was a marked increase in migrating raptors seen in spring compared to 2012, although the overall yearly total was almost identical (213 birds). Most of the ‘locally rare’ species appeared at least once, and 2 fine Bluethroats in spring were only the second and third recorded at the park. Notable absentees included Mute Swan, Common Sandpiper , Marsh Warbler and Tree Sparrow. 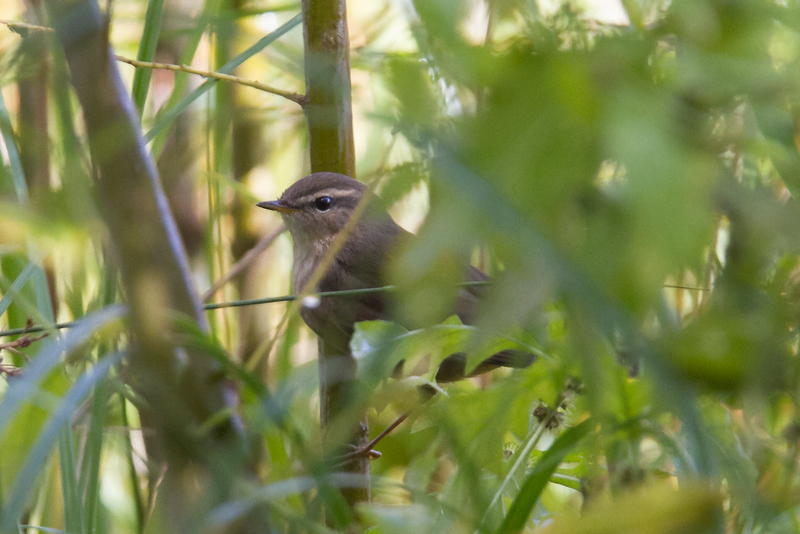 One new species was added to the park bird-list, Dusky Warbler, which spent 5 days on site in late autumn and was undoubtedly the ornithological highlight of the year. .
A rarity at Beaumonts; the birds flew northwards, low over the Cascade. Noted once in winter: 1, 6th January [PR]. Recorded in spring from 3rd February to 24th May, with a maximum of 123 on 7th April. Almost absent after 14th April. Noted on autumn passage for the first time (5 birds) on 6th September [DT]. Recorded regularly up to 20th November with a maximum of 226 birds flying south on 12th October [PR/DT]. Single birds observed infrequently and irregularly throughout the year, either fishing at the Mare Perchée or perched in the surrounding trees. In mid-August, small numbers noted flying high to the southwest in the early mornings, with a group of 8 on 14th August [DT]. 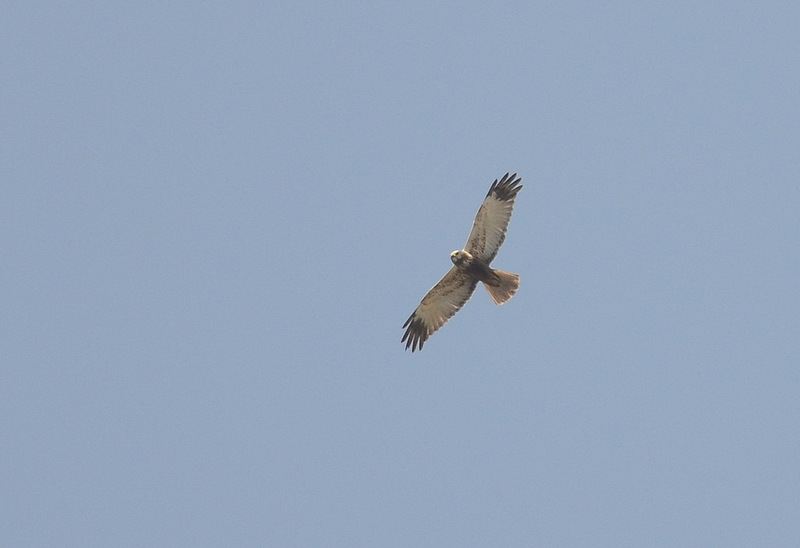 The bird flew south in the early afternoon – the third record for Beaumonts. Migrating birds seen flying over the park twice in autumn. 1, 16th September [DT] - 1, 30th November [PR]. Observed migrating over the park on 13 dates (9 in spring and 4 in autumn). Observed migrating over the park on 3 dates (2 in spring and 1 in late summer). 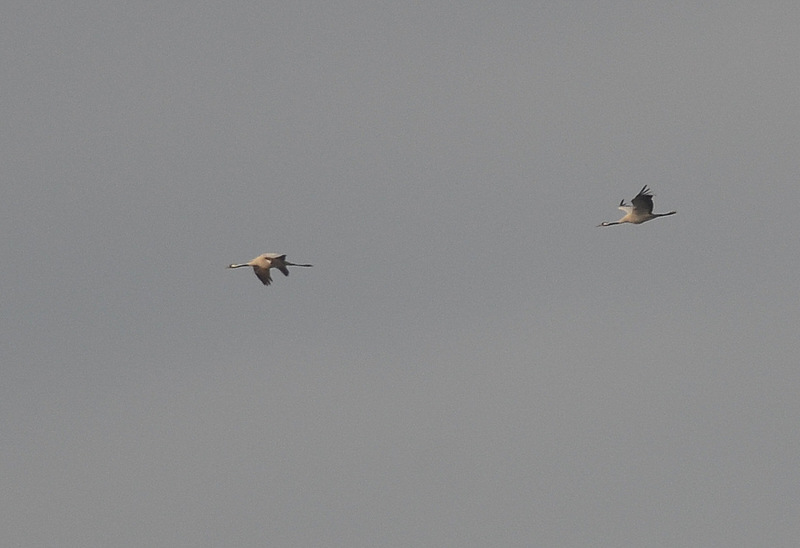 Observed migrating north on 3 dates in spring. Unusually absent in autumn. c400, 3rd February [PR/DT] , 18, 16th February [DT] - 61, 22nd March [PR]. Observed flying overhead on 2 dates. 1-6 birds observed irregularly throughout the year, although present mainly between the end of January and mid-June. 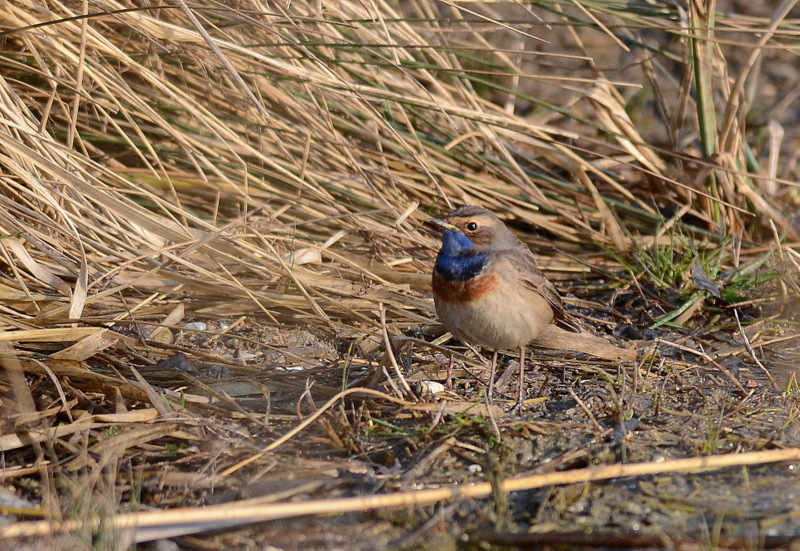 A pair was settled at the Mare Perchée by early March although their attempt at breeding was unfortunately unsuccessful, the female (unusually) appearing away from the confines of the reed bed on the 7th April [PR]. Very few records during the latter part of the year, although a pair was observed at the Mare Perchée at dusk on 22nd November [RP]. 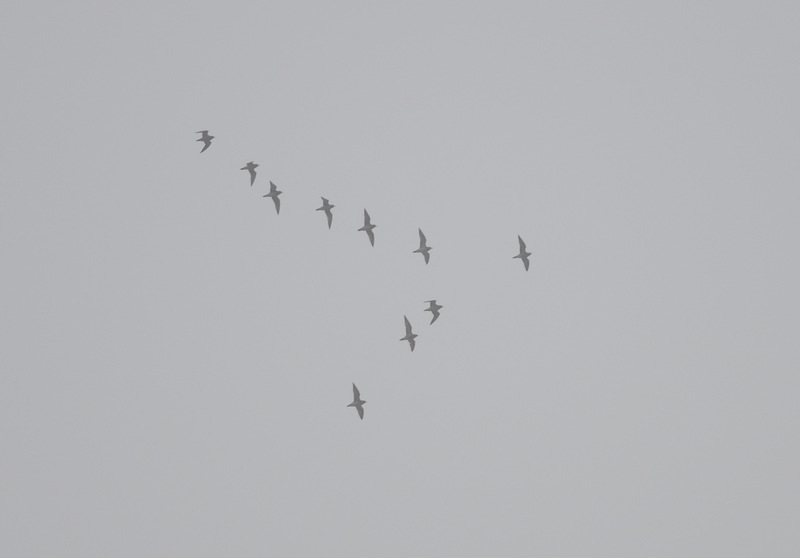 Recorded migrating over the park on 5 dates (1 in spring and 4 in autumn). Observed on 5 dates in spring. 1, 14th April [PR] - 1, 2nd May [PR] , 1, 9th May [DT] , 1, 12th May [PR/DT] , 1,18th May [DT]. Recorded flying over the park on 21 dates (8 in spring and 13 in autumn). At least 44 birds are involved. 1, 23rd March [DT] – 6, 7th April [QD/AL/PR/DT] , 2, 14th April [PR] , 1, 21st April [DT] - 2, 2nd May [DT] , 4, 4th May [PR/DT] , 1, 7th May [DT] , 3, 8th May [DT]. 1, 31st August [DT] - 1, 1st September [DT] , 1, 7th September [PR/DT] , 1, 8th September [QD/PR/DT] , 3, 15th September [DT/PR] , 3, 20th September [PR] , 2, 22nd September [SO/DT] , 2, 23rd September [DT] , 1, 28th September [GM/OS/DT] , 3, 29th September [DT] - 1, 2nd October [PR] , 1, 5th October [PR] , 2, 6th October [PR/DT]. A good year: recorded on 9 dates (5 in spring and 4 in autumn). 1, 11th February [PR] - 1, 22nd March [DT] - 1, 7th April [DT] , 1, 13th April [DT] - 1, 4th May [DT]. 2, 15th August [DT] - 1, 15th September [AL/PR/DT] , 1, 20th September [PR] , 1, 29th September [DT]. Noted on 34 dates (22 in spring and 12 in autumn). At least 102 birds are involved. Spring passage noted from 10th February – 9th May, with a daily maximum of 6 on 4th May [DT/PR]. Recorded in autumn from 1st September – 3rd November. An extraordinary passage of migrants occurred on 29th September when at least 35 flew south during the afternoon, including an impressive flock of 18 birds [PR/DT]. Observed migrating over the park on 20 dates (8 in spring and 12 in autumn). At least 43 birds are involved. 1, 2nd May [PR] , 2, 4th May [PR/DT] , 2, 5th May [DT] , 3, 8th May [PR/DT] , 4, 9th May [AL/DT] , 2, 11th May [PR/DT] , 4, 12th May [AL/PR/DT] , 1, 19th May [DT]. 1, 4th August [PR/DT] , 5, 11th August [PR/DT] , 1, 15th August [DT] , 1, 24th August [DT] , 3, 31st August [DT] - 1, 1st September [DT] , 1, 2nd September [PR] , 1, 4th September [PR] , 2, 7th September [PR/DT] , 5, 8th September [PR/DT] , 2, 15th September [PR/DT] , 1, 22nd September [SO/DT]. Several sightings in early autumn appeared to involve local, wandering individuals rather than birds in active migration. During the afternoon of 11th August, for example, several individuals drifted aimlessly in various directions, at least one of which suffering the attentions of an aggressive Peregrine. 1 or 2 individuals engaged in display-flights, a behavior not previously witnessed at Beaumonts. Unidentified larger raptors reported on 22 dates (15 in spring and 7 in autumn). 34 individuals were involved (26 in spring and 8 in autumn). Regularly recorded (usually 1-3 individuals) throughout the year. Breeding probable but, unlike the last 6 years, not confirmed. In spring and (especially) autumn small numbers occasionally noted migrating during skywatches. For example, 1 on 31st March and 3 on 29th September. Although the vast majority of sightings refer to local birds, some were apparently in active migration (ex: 1, 24th April and 2, 12th October). A single bird noted daily in early September flying northwest early in the mornings [DT]. Last autumn sighting on 28th September [PR]. The regular presence of breeding birds at the nearby Porte d’Ivry (94) has made the species less of a rarity. Recorded on 7 dates: 1, 16th February [DT] - 1, 14th April [PR] - 1, 8th May [DT] - 1, 18th August [PR/DT] - 1, 7th September [DT] - 1, 21st September [PR] - 1, 5th October [DT]. The individual on 18th August (a juvenile) was particularly entertaining, making several stoops at a pair of Honey Buzzards. In typical fashion the bird was in active migration, circling several times over Montreuil before dashing away to the southwest. A familiar resident breeding species with 1-5 birds observed almost daily throughout the year. Breeding confirmed at the Mare de Brie with up to 4 chicks present from 27th May-3rd June [PR]. A pair at the Mare Perchée produced a second brood: 3 recently fledged chicks observed there in the company of a juvenile on 27th July [PR]. Rare passage migrant. Birds migrating over the park observed on 2 consecutive days in early spring. 2, 5th March [DT] - 21, 6th March [PR]. Seen flying over the park in small groups on 9 dates. c140, 1st January [PR] - 134, 16th February [PR/DT] - c85 , 23rd February [PR/DT] - c180, 9th March [DT] - 1, 8th May [DT] - c160, 6th October [PR/DT] - 45, 18th October [PR] - 103, 24th October [PR] - 89, 11th November [PR]. Seen flying over the park on 3 dates in spring. 28, 10th March [DT] - 1, 17th March [PR] - c65, 31st March [DT]. 1, 27th March [DT] - 1, 29th March [DT]. Observed on 5 dates (1 in spring, 3 in autumn and 1 in winter). 1, 24th March [GM/DT] - 1, 20th October [DT] - 1, 23rd October [BG] - 1, 1st November [DT] - 1, 7th December [DT]. 2, 7th September [CF/DT] - 1, 17th September [DT]. Daily maximum of 150 noted on 3rd March [AL/PR/DT]. During March small groups noted flying northwards in the early mornings [DT]. In autumn, daily maximum of 93 on 6th October [AL/PR/DT]. In December single birds noted occasionally landing on site, either at the Mare Perchée or on lamp posts inside the recycling plant. Rather uncommon in all seasons – noted on 7 dates. 1, 14th January [PR] - 1, 14th March [PR] - 1, 2nd April [DT] - 1, 11th April [DT] - 1, 11th May [PR/DT] - 1, 28th July [PR/DT] - 1, 19th December [PR]. Observed less frequently than the preceding species, and there were fewer records compared to 2012. No doubt under-recorded due to difficulties with the identification of large gulls. 2, 14th March [PR] - 3, 9th May [DT] - 3, 12th May [PR/DT] - 1, 22nd December [PR]. Fairly common - reported in small numbers in winter, spring and autumn. A maximum of 14 noted on 15th September. An exceptionally large movement of gulls was noted on 20th September, when a total of 387 flew south during the late afternoon [PR]. 2 flying north on 24th May [DT]. A reasonably common non-breeding resident. Observed fairly regularly flying over the park throughout the year in low numbers (usually 1-3 birds). Up to 3 birds observed perched on buildings to the northeast (and outside) of the park where breeding is suspected. Post breeding (from the end of June), groups comprising adults and juveniles regularly noted on the lawns in the northern section of the park. Flocks on migration noted occasionally; for example, 20 on 11th November [PR]. Uncommon migrant. Recorded on 3 dates (2 in spring and 1 in autumn). 2, 7th May [DT] - 1, 27th May [PR]. Almost always noted flying overhead on active migration, it is worth noting the observation of a perched individual singing from a tree on 27th May. As in 2012, first spring arrival noted on 13th April [PR/DT]. Fewer birds than usual observed this year, with roughly 150 birds in the skies in late summer/early autumn. Active migrants in autumn noted from 28th July – 5th September, with up to 80 birds noted on 4th and 11th August. Last recorded on 5th September [DT]. Uncommon passage migrant. One observation in spring. The bird was spotted in active migration, flying purposefully high to the northeast in the early afternoon. Reasonably common non-breeding species. Single birds and/or small flocks seen or heard irregularly throughout the year flying noisily over the park, presumably to and from breeding colonies at Parc Montreau and Roissy. There has been a disturbing increase in the number of birds landing and feeding on site, although this behavior still remains relatively uncommon. A rarity at Beaumonts, the bird spent the whole day on site. Sadly it was lastly seen on the ground next to the entrance path, tugging on a strip of coloured plastic and oblivious to all the people passing very closely by. Very uncommon and irregular. Observed on 4 dates along the Allée des marronniers during January-February. 1,19th January [DT] , 1, 21st January [PR] , 1, 22nd February [PR] , 1, 25th February [PR]. A discreet and rather uncommon resident. Rather a disappointing year. Single birds observed irregularly in spring, autumn and winter. Breeding possible but unconfirmed. Not reported between 29th March and 16th November. Noted for the first time in spring on 1st March [DT] and observed fairly regularly until 7th April (maximum 32 on 4th March). First appearance in autumn on 7th October [PR]. Recorded up until 29th October with a maximum of 58 on 24th October. Unusually recorded on site in winter (after snowfall) - 1 seen and photographed on 19th January [RP]. 1-3 birds noted in spring on 4 dates: 1, 16th February [DT] – 3, 22nd March [DT] - 2, 23rd March [DT] - 1, 14th April [GM/DT]. Recorded on 6 dates in autumn: 16, 5th October [DT] - 6, 6th October [QD/ML/PR/DT] - 1, 7th October [PR] - 6, 12th October [PR/DT] - 1, 18th October [PR] - 2, 24th October [PR]. First recorded in spring on 23rd March [DT]. Spring migrants noted in small numbers on 18 dates up to and including the 18th May with a peak of 26 on 14th April [PR/DT]. Autumn migrants noted regularly from 30th August – 26th October with a maximum of 107 on 22nd September [SO/PR/DT]. First recorded on 13th April [PR/DT]. In spring 1-6 birds noted regularly up to 17th May. Small numbers noted regularly in August (about 20 birds around the antenna-building during the last week of the month, as has been the case in previous years). Last sighting on 18th October [PR]. Observed in spring, occasionally landing on site, from 5th March – 17th April, with a maximum of 26 on 7th April. Absent in summer. First noted in autumn on 20th September. Small numbers observed irregularly thereafter until 1st November, with a peak of 69 on 28th September [GM/OS/DT]. First recorded in spring on 25th March [DT]. Noted thereafter on 12 dates up to and including the 12th May. First noted in autumn on 15th August. Small numbers noted on 23 dates up to and including the 28th September, with a peak of 11 on 6th September. Extraordinarily another late, solitary and silent individual was to grace the Petite Prairie and Compost area at the end of autumn: 1, 29th October [OL/PR/DT]. 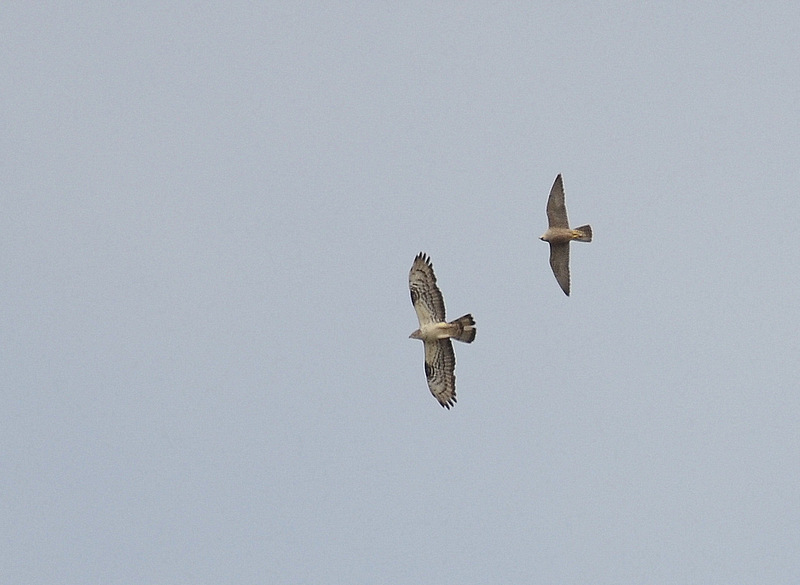 The bird was in the same spot as other late individuals recorded in 2008 (Oct 20th & 22nd) and 2010 (Oct 23rd-24th). First reported in spring on 16 February [DT]. Small numbers noted on 16 dates thereafter until 24th May with a maximum of 18 on 4th March. Not recorded between 20th April-24 May. Absent in summer. Noted in autumn on 17 dates from 29th August – 30th October, with a maximum of 30 on 12th October [PR/DT]. First reported in spring on 14th April [DT]. Small numbers noted on 6 further dates until 19th May. 1-2 birds recorded on 11 dates in autumn from 24th August – 25th September. As usual observed mainly during the second half of the year, especially September. No records between 21st March – 6 September. Recorded once in January (5th) [DT]. In spring noted on 8 dates between 10th February – 21st March. 1 clearly migrating north on 5th March [DT]. Noted for the first time in autumn on 6th September, and then on 19 further dates (sometimes in active migration) up to 26th October. Daily totals bolstered in early spring and autumn by migrants (for example, 12+ on 30th March [DT] ; 15 on 25th October [AL]). A disappointing poor year with fewer records than usual – breeding unconfirmed and unlikely (no reports in summer). Noted on 14 dates (5 in spring and 9 in autumn). 1, 13th April [DT] - 1, 14th April [DT] - 1, 23rd April [PD] - 1, 2nd May [PR] - 1, 11th June [PR]. 1-2 passage migrants noted in autumn from 25th August [DT] – 19th September [PR]. Rather irregular and uncommon migrant. Absent during the summer (although breeding in the immediate vicinity of the park). 1-6 birds noted on 15 dates (10 in spring and 5 in autumn). 1, 14th March [PR] - 6, 23rd March - 3, 27th March - 3, 29th March - 3, 30th March - 2, 31st March - 1, 1st April - 1, 12th April - 1, 21st April - 1, 19th May [DT]. 1, 19th September [PR] - 1, 22nd September - 3, 4th October - 1, 6th October - 3, 18th October [PR]. Uncommon but regular migrant. Observed on 17 dates (4 in spring and 13 in autumn). 31st March (1) [PD] - 13th April (1) [DT] - 24th April (1) [PD] - 28th April (1) [DT]. 1, 21st – 25th & 27th August (1) [PR/DT] - 1, 7th-8th September (1) [DT] - 2, 14th – 16th September [DT] - 1, 2nd October [PR] - 1, 8th October [PM]. Observed on 6 dates in autumn. 1, 21st August [PR] - 1, 25 & 27-28 August [DT] - 1, 1st September [DT] - 1, 8th September [DT]. Observed on 3 dates (2 in spring and 1 in late autumn). 1, 4th March [DT] - 1, 24th March [GM] - 1, 24th November [PR]. Rare passage migrant. Observed on 3 dates in spring. 1, 5th April [DT] - 1, 6th & 7th April [QD/PR/DT]. 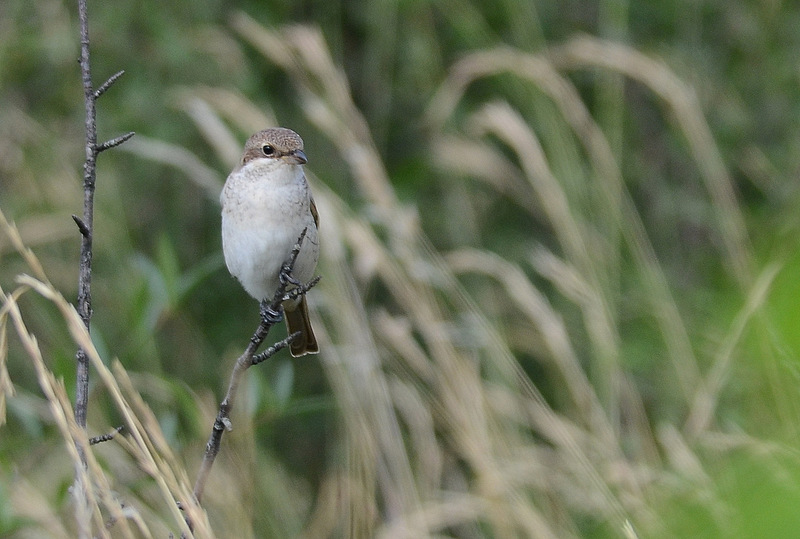 Only the second and third records for the park, 2 different birds were involved: a relatively drab individual found in the Petite Prairie was followed over the next 2 days by a superb singing adult male at the nearby Mare Perchée. This recording of the latter’s infrequent and discreet singing was taken [DT]. Uncommon but regular passage migrant. Noted on 7 dates (6 in spring and 1 in autumn). Common breeding resident. Small numbers (usually 1-5 birds) seen daily. Higher daily totals noted sometimes in late autumn and winter (for example, 14+ on 13th January [DT]). Uncommon migrant in late autumn, spring and in winter. Noted on 19 dates; 14 at the beginning of the year (from 19th January – 4th April) and 5 in autumn. 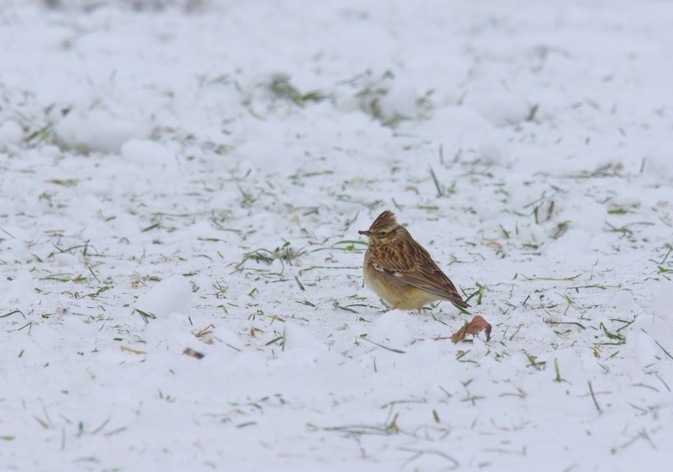 Up to 22 birds present on site after snowfall during the third week of January [AZ/RP/PR]. Active northward migration noted for the first time on 23rd February [DT]. 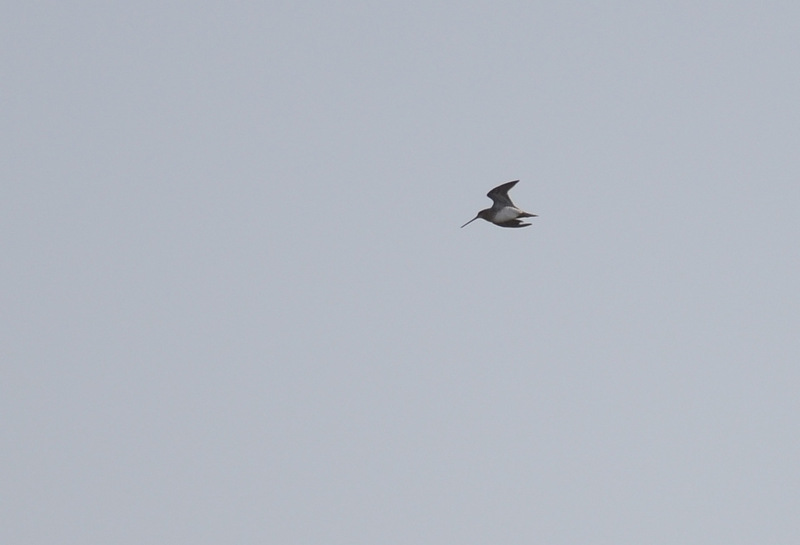 However as severe weather settled to the north at least 45 birds were seen flying back towards the southwest during the early morning of 13th March [DT]. In autumn noted on 5 dates from 10th October – 25th November. Maximum of 29 noted on 19th October (3 groups flying east during the afternoon [DT]). Rather discreet but common breeding resident – at least 3 breeding pairs estimated. 1-5 birds usually seen or heard daily. Passage migrants increase numbers in spring and autumn. Spring migration noted in March and early April : recorded on 12 dates from 4th March – 7th April, with a maximum of 163 on 22nd March [DT]. Return passage observed on 13 dates from 20th September – 29th October, with a maximum of 200 on 25th October [AL]. 1-10 birds present on site at the end of January and during February. Early in the year noted on 16 dates (sometimes in active migration) from 19th January – 14th April. First observed in autumn on 6th October. Migrants noted thereafter up to 30th November with a maximum of 45 on 19th October. Recorded once in December (the 3rd [PR]). Reasonably common resident with 1-3 birds seen almost daily in early spring, autumn and (especially) winter. Breeding probable either in or very close to the park. Very discreet and seldomly observed in late spring and summer (not recorded between 2nd May-20th September). As usual, small numbers observed on migration: in spring 2 noted on 11th February [PR], and 4 flew north on 6th March [DT]. In autumn 1-5 birds noted flying over the park towards the south on 4 occasions between 20th September – 25th October. A much better year – breeding confirmed for the first time since 2010. First recorded in spring on 11th May, and 2 singing birds present at the Mare Perchée on May 24th. An individual noted in the Savanna on several days at the end of August [DT]. Adults feeding young observed on 7th September [DT]. Last seen in autumn on 19th September. Unlike in 2011 and 2012 the authorities refrained from cutting the reed bed in early spring, no doubt accounting largely for the breeding success this year. Very uncommon passage migrant. 3 observations in autumn. 1, 18 & 19 August [DT] - 1, 7th September [DT]. First reported in spring on 27th April [PR/DT]. 2 singing birds heard regularly in the Savanna at the beginning of May, although little singing could be heard at the end of the month [DT]. Discreet and seldomly observed in summer. 1-2 birds noted on 5 dates from 15th August – 7th September. Exceptional ‘fall’ of migrants on 19th September when 6 birds observed, the last sightings of the year [PR]. First recorded on 18th March [PR]. 1-2 observed irregularly thereafter until 10th April when a significant arrival occurred [DT]. Sadly now a rather uncommon non-breeding migrant. Noted on 4 dates in spring. Unlike 2012, recorded on several dates in autumn. 1, 21st April [QD/RP/PR/DT] - 1, 27th April [PD/DT] - 1, 2nd May [PR] - 1, 11th May [DT]. 1, 20th August [PR] - 1, 21st August [DT] - 1, 12-14th September [DT] - 4, 15th September [DT] - 1, 19th September [PR] - 1, 21st September [PR]. A fairly common summer visitor, seen or heard daily. 1-2 breeding pairs estimated. First reported in spring on 14th April [DT]. 1-3 noted regularly in August and September. Last seen on 22nd September [AL]. A disappointing year, H polyglotta failing to breed for the first time in several years. Observed on 7 dates (4 in spring and 3 in autumn). 1, 9th & 11th & 15th May [DT] - 1, 25th May [PR]. 1, 15th August [DT] - 1, 18th August [PR/DT] - 1, 19th August [OL/DT]. The authorities' decision to cut down most of its traditional breeding area in early spring no doubt had a negative impact on the well-being of the species this year. First recorded in spring on 2nd April [DT]. Singing birds noted irregularly thereafter until 19th May. Up to 4 birds recorded fairly regularly in autumn from 15th August – 21st September. Feeble presence on site in winter at the beginning of the year (3 records in January-February [PR]). First recorded (singing) in spring on 3rd March [DT]. Thereafter generally 1-4 birds noted daily throughout the spring and summer. As in 2012 (and contrary to preceding years), rather feeble presence in autumn (generally 1-6 birds noted daily in August-October). 1-2 birds noted daily in December, with 6 on 4th December [PR]. An individual was found and identified by MZ on 21st October. Interestingly its occurrence coincided with that of the following species; it was to be either seen or glimpsed by several other birders at this period. 1, 21st-23rd October [TC/YM/MZ et al]. 20th-24th October (1) [QD/GM/PR/DT et al]. Easily the bird of the year this was a first for the region and only the second inland record for France. The bird was found late in the morning by DT after a prolonged period of light rain. Initially detected calling from the bases of tall weeds at the Compost it was later re-found at the nearby Mare Perchée, where it was to take up residence for the following 4 days. Although it proved difficult to see the majority of visiting birders managed to obtain brief views as it chivvied around the low willows and reeds at the water’s edge. Two photographs were obtained [TC/MZ], along with this recording of its calls [DT]. Rather uncommon resident – breeding unconfirmed. Small numbers (1-4 birds) at the beginning and the end of the year. Not reported from 27th April – 21st September. Rather uncommon resident. Breeding possible but not confirmed. Apparently absent in January and February. First recorded on 9th March [DT]. 1-5 birds seen or heard singing irregularly thereafter until 28th April. Not reported from 28th April – 29th August. 1-5 birds noted fairly regularly in autumn and winter, from 29th August to the end of the year. Rather uncommon passage migrant in spring and autumn. Observed on 7 dates (2 in spring and 5 in autumn). 1, 13th May [DT] - 1, 18th May [DT]. 1, 21st August [DT] - 1, 22nd August [PR] - 1, 7th September [PR/DT] - 1, 8th September [DT] - 1, 15th September [DT]. Passage migrant recorded on 16 dates (1 in spring and 15 in autumn). 1, 15th August [DT] - 1, 16th August [PR] - 1, 21st August [PR/DT] - 1, 22nd August [PR] - 1, 23rd & 25th-26th & 28th-29th & 31st August [DT] - 3+, 8th September [PR/DT] - 1, 12th & 14th-15th & 17th September [DT]. 1, 12th January [CF/DT] - 2, 17th January [PR] - 1, 23rd January [PR] - 1, 22nd February [PR] - 2, 2nd March [PR/DT] - 1, 30th March [DT]. 3, 12th October [DT] - 3, 23rd October [BG]. The birds were generally found in the conifers in the northern section of the park. Uncommon resident. Another rather good year with 1-2 birds seen or heard fairly regularly at the beginning and end of the year. Not recorded between 6th March – 31st August. Up to 12 birds seen irregularly throughout the year. A pair observed constructing a nest along the Sentier des Vergers on 30th March. Interestingly the nest was totally exposed, constructed at a bare fork roughly 4 meters from the ground. Breeding confirmed here with at least 5 adults taking food to the nest during the second week of May. True to form, a caudatus was either very discreet or absent for a period in summer (no records between 15th May – 27th August). 1, 21st August [PR] - 1, 5th October [DT] - 1, 29th October [OL]. Fairly common breeding resident (at least 2 pairs estimated). Singletons observed regularly throughout the year. Unusually observed frequently during April and May, a nest being found near the Jean Moulin entrance on 14th April which was still active on 8th May [DT]. Rare passage migrant in spring and autumn. 1, 18th – 19th August [OL/PR/DT]. 2, 6th February [PR] - 27, 5th March [DT] - 14, 6th March [DT] - 35, 9th March [DT] - 2, 7th April [DT] - 1, 13th April [PR/DT] - 3, 3rd May [DT]. 1, 15th September [PR/DT] - 1, 6th October [DT] - 11, 19th October [DT] - 5, 24th October [PR] - 9, 25th November [PR]. A rather uncommon migrant. Records typically involve small, loose groups of less than 10 birds flying purposefully overhead. Noted on 14 dates (1 in winter, 7 in spring and 6 in autumn). 2, 5th March [DT] - 7, 6th March [PR/DT] - 3, 9th March [DT] - 4, 15th March [PR] - 2, 12th April [DT] - 2, 14th April [DT] - 1, 8th May [DT]. 1, 19th September [PR] - 10, 12th October [PR/DT] - 2, 18th October [PR] - 4, 19th October [DT] - 1, 24th October [PR] - 9, 30th October [AL/OL/DT]. Common breeding resident. Usually between 1-10 birds noted daily. Larger numbers occasionally present (for example, a flock of 40 on a nearby building on 10th March [DT]). Migration observed in spring on 8 dates between 16th February – 27th March. On 13th March at least 1600 flew southwest in large groups early in the morning, perhaps influenced by extreme weather to the north (similar movements of Fieldfares occurring simultaneously [DT]). Up to 174 observed apparently migrating in autumn on 8 dates from 29th September – 30th November. Uncommon but regular passage migrant. Observed twice in spring. 1, 8th May [DT] - 1, 17th May [DT]. The bird on 17th May was present on site from 06h30-07h00, singing from the Bois de Bordure. Common passage migrant: in spring noted flying northeast on 18 dates from 4th March – 14th March with a maximum of 236 on 22nd March [PR/DT]. Migration noted at the end of autumn with rather average numbers flying southwest noted on 20 dates between 25th September – 24th November. Maximum of 360 on 25th October [AL]. In spring small numbers noted on 16 dates from 7th February– 17th April, with a maximum of 43 on 22nd March [DT]. In autumn noted on 6 dates from 12th – 30th October, with a small peak of 16 birds on 19th October [DT]. Recorded once in winter (1, 14th January [PR]). First recorded in spring on 7th February [PR]. Small numbers noted thereafter on 19 dates up to 11th May, with a maximum of 18 on 14th April [DT]. First recorded in autumn on 26th September. Observed on 13 further dates up to 3rd November with a maximum of 17 on 25th October [AL]. Reasonably common resident, breeding in or near the park. Small numbers noted fairly regularly, although rarely seen in summer (only 2 reports between 24th May – 18th September). Small numbers noted irregularly in winter – a flock of about 25 Present on site during the first 2 weeks of January. Small numbers in active migration observed occasionally: in spring 1-7 on 7 dates from 6th March – 15th April, and in autumn 1-2 on 5 dates from 24th September – 18th October. Noted on migration in spring and autumn. Up to 22 birds noted regularly on site in February. Recorded in spring from 8th February – 7th April. First noted in autumn on 19th September [DT], although not observed subsequently until 12th October. Small numbers noted fairly regularly thereafter until 11th November. One observation in winter: 1, 5th December [PR]. Singing male noted for the first time on 16th February [DT]. 1-2 birds noted irregularly from the beginning of March, and heard daily from the re-cycling plant during the first week in May [PR/DT]. Irregular in winter: no records this year in January and December. 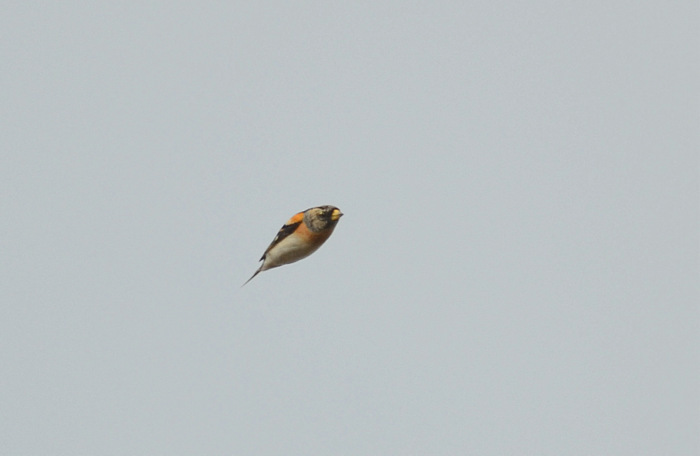 Singletons noted in active migration on just 4 occasions in autumn, from 7th – 24th October. A discreet but reasonably common resident, breeding inside the park. 1-2 birds seen or heard fairly regularly. Not reported in summer (between 24th May – 15th August). A juvenile present in the Savanna on 15th August [DT]. Rather uncommon winter visitor and passage migrant. Present on site at the beginning of the year, especially during March. 1-3 birds observed on 22 dates from 13th January – 14th April. Actively migrating birds noted on 7 dates between 6th March – 7th April, with a maximum of 9 on 22nd March [DT]. Unusually scare during the latter part of the year – only 3 records in autumn : 1, 30th & 31st August – 1, 29th September [DT]. Uncommon and irregular migrant. Noted flying northwards over the park on 2 dates in autumn. 2, 6th October [DT] - 1, 25th October [AL]. 1-8 birds noted regularly on site at the beginning of the year, from 2nd January – 17th April. An individual observed on 2nd February had been fitted with a silver ring on its left leg [DT]. 1-6 noted in active migration on 4 dates in March. As usual, absent at the end of spring and in summer ; no records between 18th April – 13th October. Relatively few records in the latter part of the year: up to 15 noted regularly in October (active migration on 5 dates). Almost absent in winter: 2, 24th November [PR] - 1, 5th December [PR]. Uncommon migrant. Observed on 3 dates (2 in spring and 1 in late autumn). 1, 6th March [DT] - 1, 9th March [DT]. The bird seen in the early morning of 6th March, a fine male, landed briefly in the reed bed at the Mare Perchée before continuing its migration north. Sadly now an uncommon, non-breeding species. Observed in the snow on 2 dates in winter at the beginning of the year. 2, 17th January [RP/PR] , 2, 19th January [DT].